On display will be the company’s latest technological contributions aimed at promoting knitted applications in the field of technical textiles, designed and produced on SHIMA SEIKI’s lineup of advanced computer design systems and com­ puterized flat knitting machines. 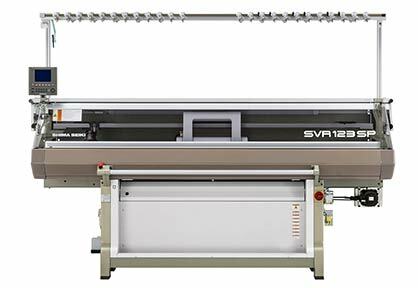 The company will exhibit its latest SVR123SP shaping machine which features a dedi­ cated loop presser bed mounted above the rear needle bed. This permits full use of inlay technique for the production of hybrid fabrics that feature both knit and weave characteristics, suited to various technical applications. At Techtextil North America the SVR machine will operate together with the Yarn Unwinding Option that yields optimum yarn feed and tension for use with technical yarns that are otherwise difficult to handle. Together they will be producing knitted fabrics for automotive interior applications for upcoming mobile office and living­room scenarios arising from self­driv­ ing cars. Also on display will be the company’s renowned WHOLEGARMENT® knitting technology that is capable of pro­ ducing knitted items in their entirety without the need for sewing. Seam­free WHOLEGARMENT® smart garments will be presented as proposals in wearable technology for bio­monitoring in the sports­apparel industry, as well as remote monitoring for the medical and caregiving industries. The latest version of SHIMA SEIKI’s SDS­ONE APEX3 3D design system will also be available for demonstrations in design and simulation of various technical textiles. Of particular interest is its ultra­realistic simulation capability that realizes Virtual Sampling. When countless variations must be evaluated before arriving at a final design, virtual product samples can be used to streamline the decision­making process by minimizing the enormous amount of time and cost normally associated with producing actual samples for each variation. The sustainability factor is also undeniable con­ sidering the amount of material normally gone to waste in the sampling stage.